This was the first recipe that jumped out at me from the Donna Hay – Fast, Fresh, Simple book. I’ve added the chorizo because, well, CHORIZO. Pop the bread, tomatoes, garlic, seasoning and some oil in a processor and whizz to a crumb. Cook the pasta as required then drain and keep warm. Fry the chorizo until crisp. Remove from the pan and wipe out the oil. Cook the crumb in the pan for around half an hour. 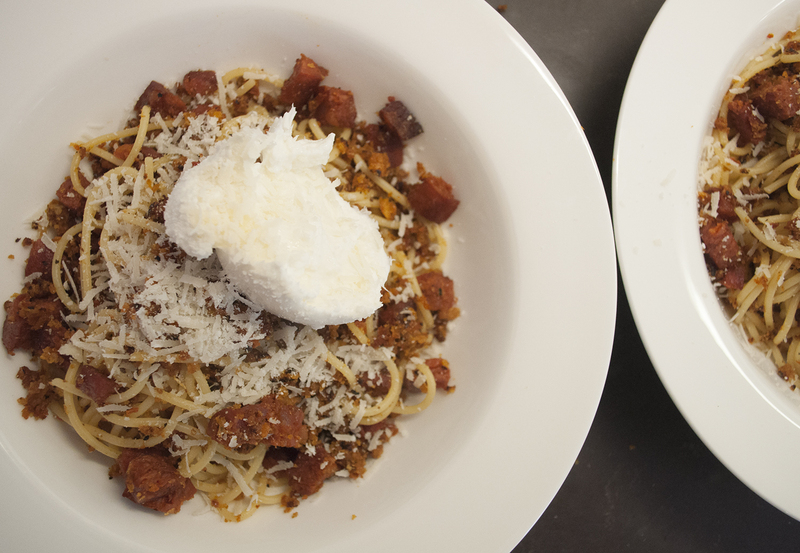 Toss the crumb with the pasta and chorizo. Divide between the plates and sprinkle with parmesan. Tear the ball of mozzarella in half and serve on top of the pasta. Drizzle with a little more oil and some balsamic vinegar. Scatter with torn basil leaves (this stage not shown on photo). This crumb was so tasty. I’m glad I added the chorizo for obvious reasons but a great meat-free meal without.